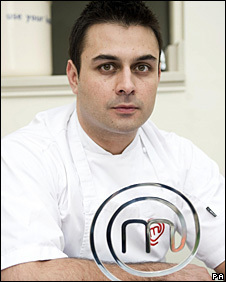 Dhruv Baker has been named the winner of the BBC’s amateur cooking competition Masterchef. The 34-year-old Londoner beat follow finalists Alex Rushmer and Tim Kinnaird to the title following an intense cook off. During the Masterchef series Baker, who described his win as “mind blowing”, faced challenges like cooking in the heat of the Indian desert and preparing a meal for celebrated French chef Alain Ducasse. In the final, Baker and his fellow competitors were asked to create a menu from a box of mystery ingredients. They were then taken to a three-Michelin-starred restaurant in Europe, before cooking their final three-course meal for the judges. Baker’s winning menu consisted of a starter of saffron and ginger poached lobster tail with celeriac purée on blanched fennel with a burnoisette foam; followed by a main course of venison with a potato, brunoise and fenugreek crust, sugar glazed carrots on a carrot and cumin purée, confit chestnuts and a venison jus. His dessert comprised a trio consisting of poached pear in sauterne and star anise, massala chi ice cream, and a chocolate truffle with a pistachio topping. Judge John Torode said Baker had a “talent that very few people will ever have”. Baker said he now hopes to open his own restaurant. “I hope that winning Masterchef will allow me to pursue my dreams of a career in food and to continue learning and improving as a cook,” he said.